Keep your little one smiling all day long with these lace-up sneakers that feature a sleek design! These shoes will instantly brighten up your kid's wardrobe and make her everyday outfits smarter. 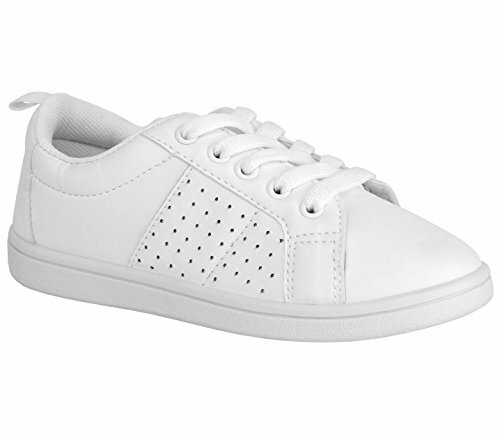 Made with the excellent quality material, these white tennis shoes are both elegant and classy. They have a soft sole that ensures all-day comfort, and the laces are also dyed to match the shoes. The sneakers are quite durable and will last through tough wear and tears. In addition to the quality design and material, the sneakers are specially made for kids. Pair them with denim, shorts, skirts, or dresses; they'll add a charming look to her ensemble. The sneakers are available in sizes T5, T6, T7, T8, T9, T10 for toddlers, and the big kid sizes available are Y11, Y12, Y13, Y1, Y2, and Y3. So, get her this delightful pair of shoes now and keep up with the latest trends and styles. Chillipop is a leading manufacturer of kid's footwear and is known for providing premium quality rain boots in beautiful prints and colors. The collection of Chillipop's footwear for girls and boys is in tune with the latest trends and style. Their footwear collection comes in all styles, shapes, patterns, and bright colors that are sure to charm. The brand focuses on the comfort of little feet with its high-quality materials and exclusive pieces. It has plenty to offer little kids who are looking for vibrant colors and perfect patterns. Make Sure Your Munchkin Has The Best Looking Feet With These Chillipop Sneakers: Complete your little one's look with these comfort-oriented sneakers for kids that feature a stylish design and an eye-catching appeal. These versatile and functional pair of white sneakers is an ideal pick for every kid. Whether going to a party or having a day out, these sneakers are perfect for every occasion as they are both comfortable and trendy at the same time. Modern & Stylish Design: These kids sneakers feature an eye-catching look with a convenient lace-up closure type. With captivating design, these Chillipop sneakers are sure to make your little girl look spectacular. The shoes boast a versatile style that goes well with every outfit and will accentuate her overall look. Add this pair of tennis shoes for girls to her footwear collection today. Incredible Quality: Made with high-quality materials, the fashion sneakers are designed for durability that lasts for years to come. Wrap little feet in this functional pair for any occasion and let her move around in uncompromising comfort and timeless style. She'll walk out in style and grace with these casual sneakers. Premium Comfort: Along with the captivating design, the exceptional quality of these cute sneakers offers the utmost comfort. The lace-up closure type gives a secure and flexible fit that give your girl a cozy feel. The soft footbed and sturdy sole will give her happy feet all day long. Get a pair now to let your kid play all day in these comfortable sneakers. Available in Various Sizes: The tennis shoes are available as a toddler sneaker in sizes T5 - T10 and as a big girls sneaker in kid sizes Y11-Y13 and Y1-Y3. Furthermore, the pair comes in a sophisticated white color that will give your kid's ensemble an elegant look. Mix and match with denim or skirts to make your girl look fabulous. The color will go well with almost every outfit and still make your princess look stylish. If you have any questions about this product by Chillipop, contact us by completing and submitting the form below. If you are looking for a specif part number, please include it with your message.